Man is forbidden to look upon himself directly! Unless another object far from his essence, say a mirror, may reflect the light of his face. And by staring upon the mirror directly, then beholds himself indirectly. Similarly, Beloved forbade the lover from looking upon His True-Self. Unless another object reflects the light of His True-Face from deep within. The radiant proof of a face inescapably in love with Beloved. 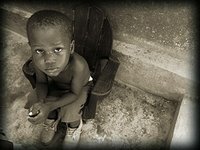 Know that the Haitian orphan is one such mirror! When suddenly comes that ephemeral moment, a chasm between the light and the darkness, when capriciously the Haitian orphan, as if a polished perfect mirror, reflects the once hidden face deep within you. You gaze upon your own bewildering beauty, as you have never witnessed before. Lovers! You may lie about yourself, you may drown in depth of self-hate, or roast your face upon the flames of pomp and false-pride to no avail. But the reflection of the orphan’s mirror shall render your true splendid image as was shaped, the very first time, by the Beloved. Lovers! Hurry and look upon this mirror, study your face and prepare yourself prior to the gala rendezvous with the Beloved Creator. Look upon yourself today, because tomorrow your Lord may not!